Winter and Hope. Photo courtesy of Clearwater Marine Aquarium. With September's release of Dolphin Tale 2 on movie screens across the country, the spotlight is back on the animal preservation efforts of Tampa Bay's Clearwater Marine Aquarium (CMA), one of the Tampa Bay CityPASS attractions. The aquarium not only serves as the real-life home to the film's bottlenose dolphin movie stars, Winter and Hope, it also works to rescue, rehabilitate and release a variety of sick or injured marine animals. In fact, marine animal rescue and rehabilitation is the foundation of both Dolphin Tale and Dolphin Tale 2. For the uninitiated, Dolphin Tale, which was released in 2011, tells the true story of Winter, a dolphin that eventually lost her tail after being injured in a crab trap. 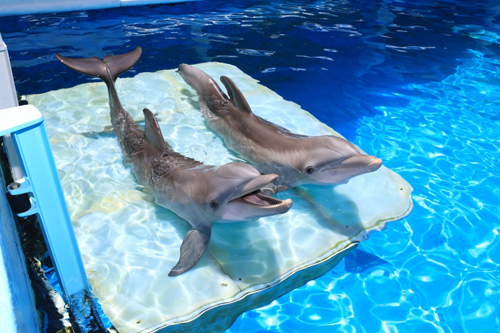 Winter was brought to the Clearwater Marine Hospital, where she was taught to swim without a tail. The film also portrays the efforts of doctors and scientists to devise and outfit Winter with a prosthetic tail. The film stars Harry Connick, Jr., Morgan Freeman, Ashley Judd, Kris Kristofferson, Nathan Gamble, Cozi Zuehlsdorff and Austin Stowell, and was directed by Charles Martin Smith. In Dolphin Tale 2, Winter's story continues with the rescue of another dolphin, Hope, whom the scientists hope can serve as Winter's companion. The stars of the first film returned to reprise their roles with the addition of Lee Karlinsky, Julia Jordan and Bethany Hamilton. Both films have received favorable reviews, providing a priceless publicity boost to CMA's good works. 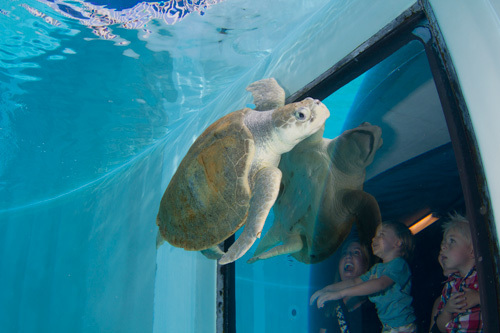 Sea turtles – In the Turtle Bayou, guests can see Titus, a sea turtle who was struck by a boat and now has problems floating. Other turtles include Ula, Cupid, Rob and Cocoa. North American river otters – With three presentations daily, visitors can giggle at Walle, Cooper and Oscar cavorting in their Otter Oasis. Sharks – Thelma and Louise, two bottom-dwelling nurse sharks are the residents of Shark Pass. Pelicans – Rufus Beach is where visitors will encounter CMA's two African Great White Pelicans, Ricky and Lucky. Stingrays – Stingray beach provides encounters with CMA's cownose and southern stingrays, as well as some tips on what to do if you ever encounter a stingray while swimming. Surgical suite – CMA is a working animal hospital where guests may have the chance to view medical professionals conducting physicals on otters or treating injured sea turtles and other animals. Animal encounters – For additional fees, guests can have their photo taken with a dolphin, assist in the feeding of a stingray, encounter a shark or be Winter's assistant trainer. CMA puts its mission of rescuing, rehabilitating and releasing sick and injured marine animals into action outside its facility. Locals, fishermen, park rangers and other visitors found most of the animals currently in CMA's care. But outside its walls, CMA's staff, interns and volunteers monitor more than 25 miles of Pinellas County's coastline to monitor sea turtle nesting activity, and to help preserve the hatchlings until they're ready to make their way back into the water. It even uses its rescue efforts to educate visitors and the public on how to better safeguard sea creatures. Last August, a dolphin calf became entangled in fishing line off the coast of Destin, Florida. The calf was seen swimming in the Gulf of Mexico next to its mother with fishing line cutting into the calf's flukes. Thanks for the efforts of a team of more than 30 people from eight organizations, including the CMA, the dolphin was located and monitored until it could swim to shallow water and have the line removed. Mike Hurst, CMA's vice president of zoological care, told reporters, "As good stewards of our environment, we need to remember to take every course of action to not leave any fishing line, hooks or lures that could potentially harm marine life."